HTC has surprised nobody by announcing the incrementally-upgraded One X+. Sporting a 1.7GHz quad core Nvidia Tegra 3 processor and an upgraded 64GB of internal storage, the new phone ticks a whole lot of unchecked boxes from the original HTC One X. The two biggest updates include an boost to Android 4.1 (plus a new version of its overlay, Sense 4+) to bring a raft of new goodies to HTC fans. There's also a an upgraded 2100mAh battery which the Taiwanese firm is praying will help dissipate some of the power-sucking issues encountered on the first iteration of the quad core One X in Europe. In terms of the overlay, new features like an enhanced self portrait mode (making use of the new 1.6MP front facing camera, which now has access to the imaging chip) as well as video and picture hubs (through HTC Watch 2.0 and Gallery respectively) make it much easier to locate and play with your media. Beyond that, it's business as One X usual – the polycarbonate body is back (with a few red accents, a la the HTC Sensation XE) along with the 8MP camera and large 4.7-inch Super LCD 2 screen. The HTC One X+ UK release date is set for early October, so not long to wait now…and thanks to a leak from O2 we could be seeing the phone landing for only £479.99 (around AU$772, US$775) (without a charger)… take that, iPhone 5 and your massive price tag. 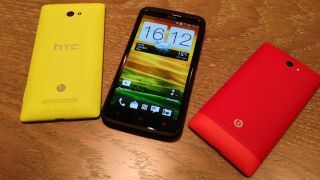 But enough from us telling you about it – well, we're still going to do that, but in more depth and with pics through our hands on: HTC One X+ review.